Paediatric dentistry focuses on children and teenagers. Modern dentistry aims to prevent dental disease and that is why it is important to start taking children to the dentist in Barcelona from a young age for paediatric dental treatments . At our dental clinic in Barcelona we offer a paediatric dentistry service specially designed for younger patients. The most important aspect of our paediatric service is education. If we show children how to look after their mouth and develop good dental hygiene from a young age, they are sure to have healthy teeth, mouth and gums in the future. Prevention is better than cure when trying to maintain a healthy mouth and this is the main aim of paediatric dentistry. Taking your children for a check-up with the paediatric dentist once a year helps to make sure they have a healthy mouth. At Barcelona Dental Studio, we have the answers to all your questions. We think prevention is better than cure and so we recommend you bring your children for a check-up once they are three years old. These days there is plenty of evidence to show that having a healthy set of first teeth has a positive effect on the health of the child’s adult teeth. Not all parents take their children to the paediatric dentist in Barcelona. In general, parents only tend to take children to the dentist when there is a problem, meaning they miss out on the most important services that a dentist specialising in treating children can offer; education and preventing illnesses or diseases in the mouth and teeth. Both the American Academy of Paediatric Dentistry and other paediatric dental associations across the world recommend that children have their first check-up before they are a year old. Obviously, these recommendations are directly linked to the importance of prevention of dental illnesses. There are three main reasons why parents should take babies to a dentist specialising in treating children: prevention, introducing dental hygiene and evaluating the child’s health. Taking children to the dentist as babies allows the paediatric dentist to explain certain issues the parents should understand in order to prevent tooth decay. For example, decay caused by bottle feeding is a particularly destructive process but one that can be controlled by a dentist specialising in treating children if seen early enough. Tooth decay that is seen in three and four-year-old children has often formed long before. There is no doubt that preventative dentistry for children is the basis for a healthy mouth in the future. This means that children should be seen by a dentist at the very latest as soon as they have all the first teeth, at around three years old. However, current thinking suggests that children should be seen regularly by a dentist from the moment their first teeth appear as the dentist can check that everything is developing correctly and if not can advise the parents on the best solution. It is hugely important that children receive good dental care to help their mouths develop healthily as adults. It is a great responsibility and a privilege to help in this process alongside parents and teachers and it is something we take very seriously as children’s dentists. When a child visits the dentist, they are usually treated by a paediatric dentist which means a dentist specialising in treating children. Paediatric dentists study for several years to have the skills to offer dental treatment that specialises in children and teenagers. In the past it was common to see dental clinics with large signs that read: “This clinic does not accept children under the age of 13 for dental treatment ”. Fortunately, nowadays these attitudes and signs like this are not normally seen on the walls of dental clinics in Barcelona, as most dentistry schools include teaching about paediatric dentistry and dental treatments for children as an important part of their courses. It is very important to get into the habit of regular visits to the paediatric dentist, even if the child has no issues with their teeth, because it helps them to see these visits to the dentist as something normal and also helps teach them how to look after their mouth to keep their teeth strong and healthy. 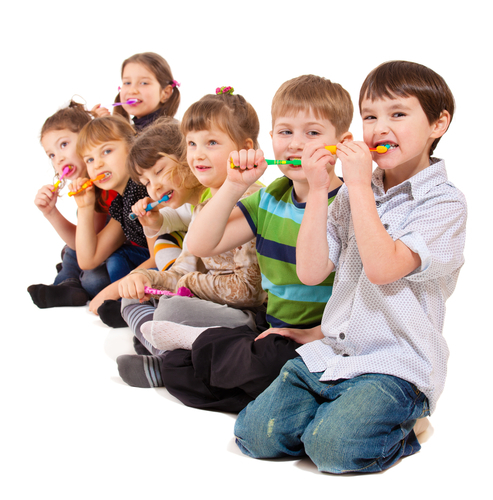 Visiting the paediatric dentist also helps parents learn how to encourage their children to look after their mouths at home as well as understanding the process of decay and how to prevent it with treatments like pit and fissure sealants, yearly application of fluoride varnish, and using toothpaste with fluoride and so on. Dental treatment for children is a challenge for the dentist, because each child has their own needs and limitations, meaning each patient needs a very personalised service. Nowadays, dentists in Barcelona have strategies that work very well when dealing with children. Making sure children visit the dentist has important advantages for their future dental health.